Hope you are all doing really well? I’m sure if some of you follow me via Twitter/Facebook you might have seen I haven’t been really feeling myself lately. There has been the incident with my car, stress at work, university, and my recent illness which has really knocked me for six the past two weeks. I have been relying on long hot baths to help relax me, and there has been one product that has turned my bath time into complete bliss. I’m sure you know that I am a massive fan of NEOM LUXURY ORGANICS not only for their luxurious products but their outstanding customer service. Purchasing and dealing with NEOM has really reminded me what customer service should be like, so huge Kudos to them for being so fantastic. 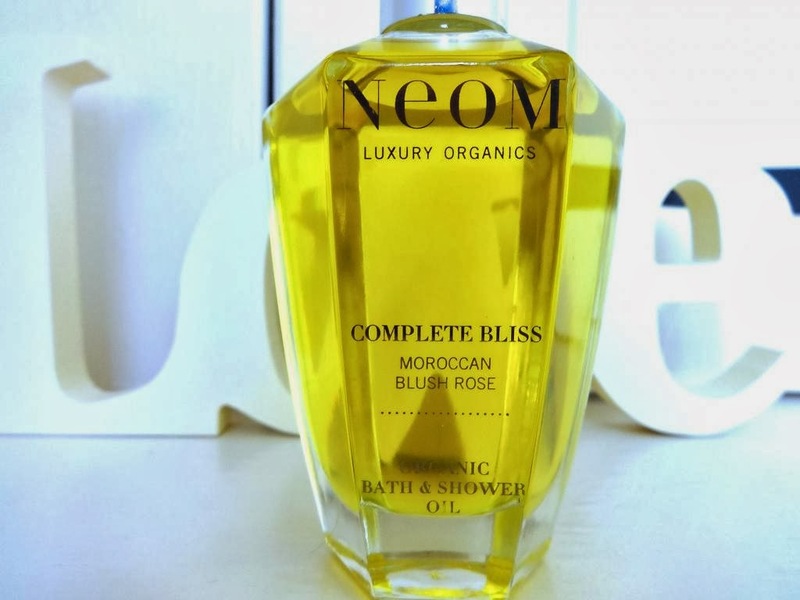 I have been searching for a luxury bath/shower oil for a while, so when I heard about the NEOM Complete Bliss Bath and Shower Oil I was really excited to try it. I have been using the oil just over a week now, and thought it would be a great time to let you know my thoughts about this product. As always lovelies, feel free to leave your links and thoughts in the comments section down below. I know this might sound a little silly, but I genuinely smile from ear to ear when I get comments from my lovely readers! NEOM are a natural and luxurious home and lifestyle brand, which create bespoke products to evoke a multitude of positive emotions. NEOM are very against synthetics and therefore only use natural and luxurious ingredients within their products. 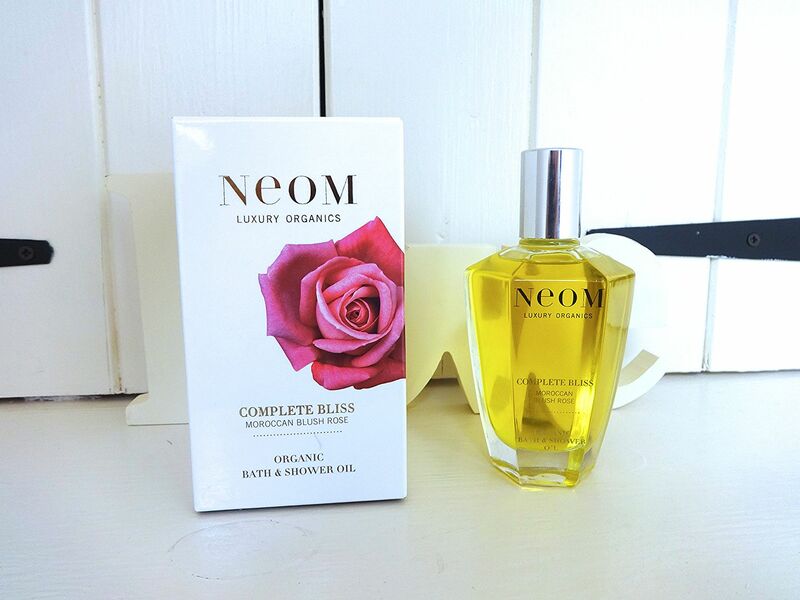 NEOM organic bath oils contain a very impressive 30% of essential oil meaning that you only need a cupful to fill your bath and entire bathroom with heavenly aromas. It also means that on average you will get 40 baths out of one NEOM bath oil, which I think is fantastic. I have tried brands where you need pretty much a quarter to half a bottle at a time. It is definitely all in the name with this product as it is “complete bliss” from the get go. Firstly, the beautiful glass bottle is well worth a mention and makes to product feel luxurious before you have even opened the bath oil itself. The light and uplifting fragrance of Moroccan Blush Rose truly makes me feel like I have left my bath and gone to heaven, which is perfect, especially with being so stressed out lately! The beautiful Rose scent is accompanied by black pepper and lime for a contemporary twist on the classic Rose fragrance. I can definitely tell the difference between a traditional Rose scent and NEOM’s updated version and I must admit I’m a huge fan. Sometimes I can find particular Rose/Lavender scents to be a little dated, but this fragrance is a complete differentt experience and best described as being “complete bliss” see it's all in the name haha. I really do love how this bath oil can be so relaxing, but uplifting at the same time. Another amazing thing about this product is how moisturising it is on your skin. When I get out the bath my skin feels really supple and the light aroma of the Moroccan Blush Rose lingers for a little while after. If that doesn't sound good enough already, I also found out that Rose is great for hay fever and lady problems *woohoo* haha. Another extremely impressive product from NEOM Luxury Organics! I would totally recommend this to anyone looking for a beautiful relaxing bath oil. The fragrance is just perfect, and helps to relax as well as uplift. I have been going through quite a stressful time and I have found soaking in this gorgeous oil to be a complete mood enhancer. I have been stepping into the bath feeling a little down, and stepping out feeling much more positive and in control .. sounds good right haha? – I also think this would make a fantastic birthday gift or for any other special occasion, as it is so beautifully presented in its stunning looking glass bottle. I'm definitely tempted to purchase myself the body oil, as it has some fantastic reviews out in the blogosphere! You can purchase products from the "complete bliss" line here :) - I would love to hear your thoughts on this post.. are you tempted to try this lovely bath/shower oil ? 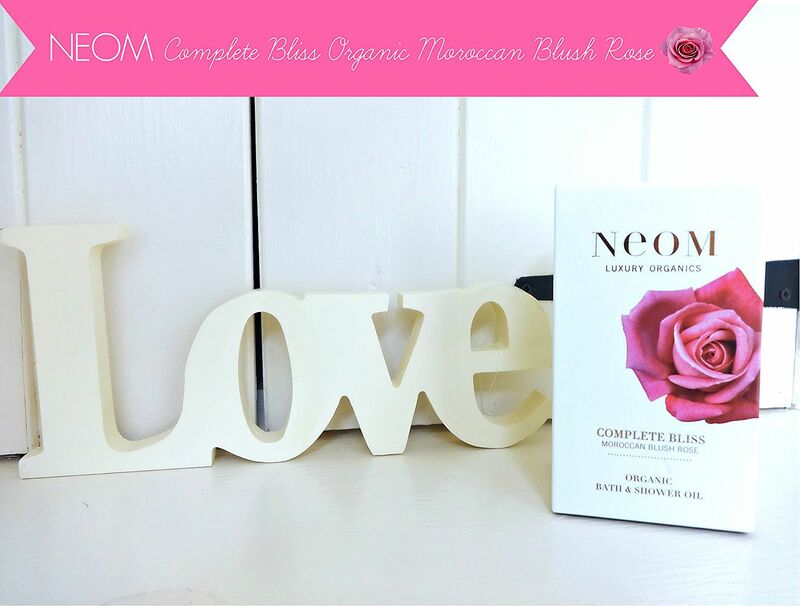 Have you read the NEOM Blog ? It's actually one of my favourites to read! The hand cream in the range is just as lush as this sounds. Love the luxury of this!